Name: BNB 04.10.19 This is Where You Want to do Business! Red Bank RiverCenter has just completed a yearlong study of Red Bank and has a 5 year plan for the growth and development for Red Bank. Monmouth County has an amazing initiative launched in 2012 by the Board of Chosen Freeholders to ensure the economic health of Monmouth County. 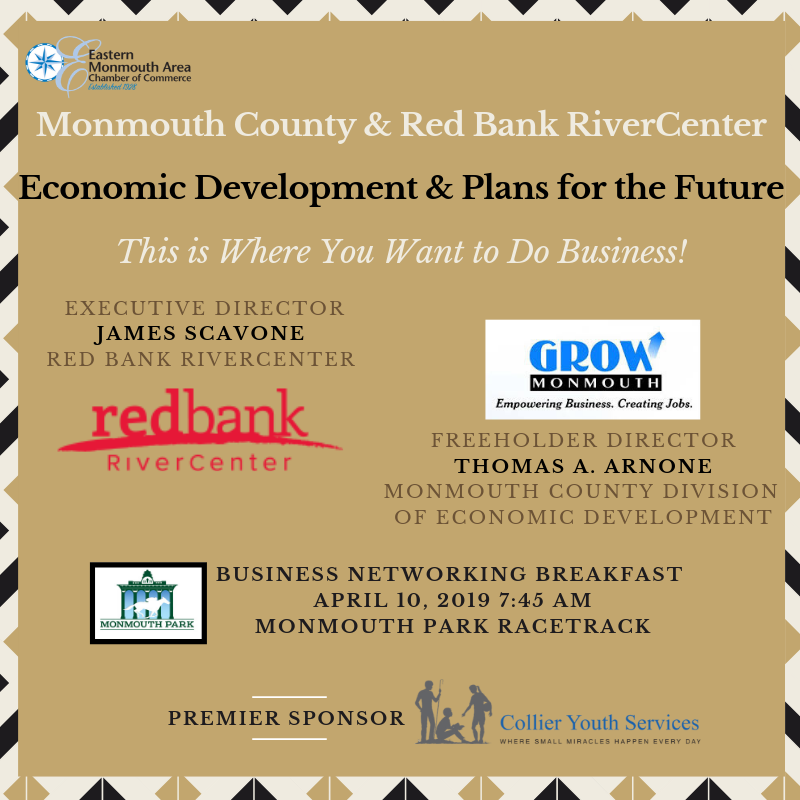 Today, EMACC Brings you the most INFORMED Members of both RiverCenter and the Board of Chosen Freeholders to share their First Hand KNOWLEDGE of these projects and how they are here to help support your businesses and the growth of our area! 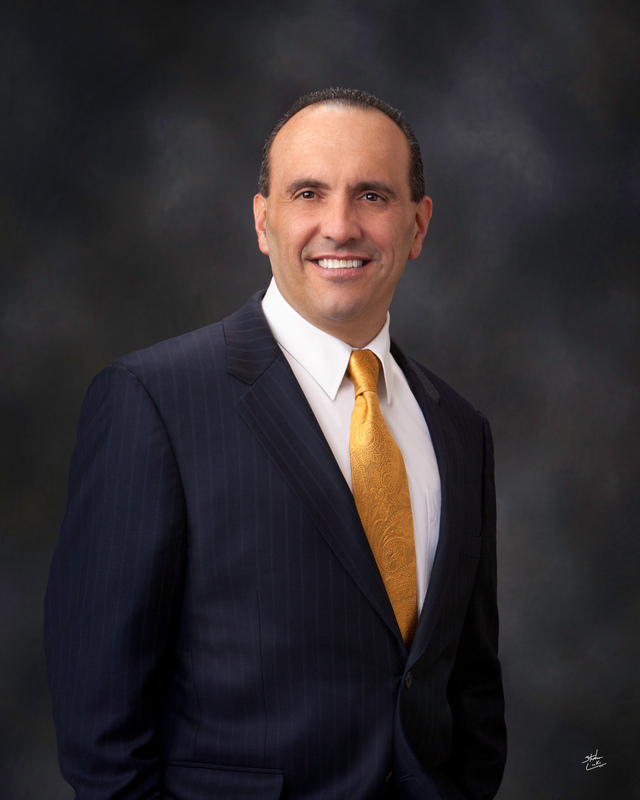 Jim Scavone is a versatile executive leader with over 25 years? experience in non-profit management handling operations, change management, fiscal management, human resources, event and promotion planning, strategic planning, program direction, and staff and volunteer management. Jim joined the RiverCenter team in 2011 as Director of Operations and was promoted to Executive Director in 2013. During that time, he has improved relations with and between members of Red Bank?s business community. An inveterate problem solver, Jim has found unique ways to attract new consumers to Red Bank?s retail center by integrating the arts into the daily life of the community. He works closely with local business experts to reduce impediments to new business recruitment. This includes working with local experts to improve the process for opening new businesses in town. Finally, he has worked hard to reduce administrative costs at RiverCenter so that more resources can be spent on business recruitment and programs that promote Red Bank and its businesses. A resident of Red Bank, Jim is an active member of several local arts organizations. Red Bank RiverCenter is the organization charged with managing the business improvement district in Red Bank. We work to make Red Bank the people?s choice to live, work, play, dine and shop. To accomplish this, we promote local merchants, recruit new businesses, stage vibrant downtown events, and beautify our streetscapes. RiverCenter is a 501(c)(3) non-profit formed in 1991. The district was formed that same year by new legislation enacted by the NJ State Legislature to help New Jersey?s many historic downtowns survive in the face of competition from rapidly expanding shopping malls, big-box discounters, and economic recession. Since that time, RiverCenter has played a key role in the transformation of Red Bank from a town dubbed ?Dead Bank? in the press to one they now tout as a thriving and exciting downtown -- an arts, dining, and shopping destination for tens of thousands of people each year. 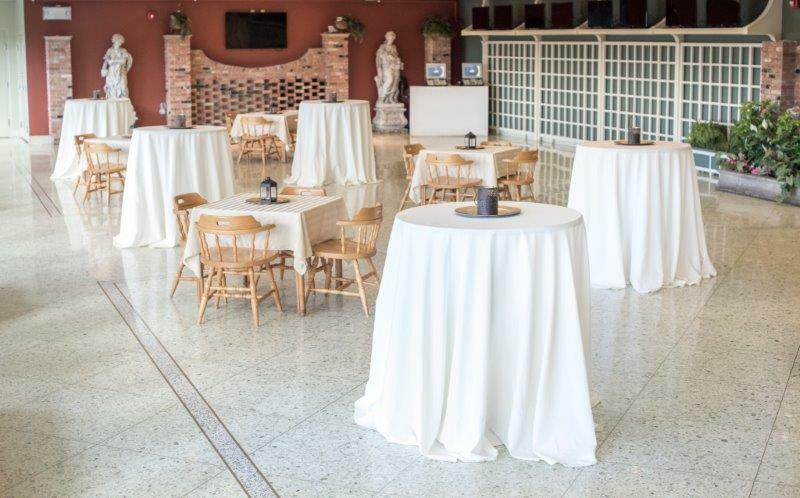 Our versatile staff and strategic programs are funded by a special assessment paid by owners of commercial property inside the SID and by funds that we raise through special events, donations and grants. Under the direction and oversight of the downtown stakeholders that fund us, we maintain a thriving downtown hub that serves Red Bank's residents and attracts visitors from across the state and beyond. Thomas A. Arnone is serving his fourth, three-year term on the Monmouth County Board of Chosen Freeholders. In 2019, he was elected by his colleagues to serve as Director of the Board. He also served as Director in 2014, 2016 and 2018, and Deputy Director in 2012 and 2013. Director Arnone oversees the County?s Department of Public Works and Engineering and also serves as the liaison to Public Information and Tourism, Economic Development, the Office of Shared Services, the Environmental Council, the Improvement Authority, the Shade Tree Commission, and the Reclamation Center. Since being elected as a freeholder, Director Arnone has been an advocate for shared services between municipalities and counties. He currently oversees one of the most successful shared services programs in the State. He established the Healthy Monmouth Initiative, bringing together students from different socioeconomic backgrounds to learn about good nutritional habits. In addition, Director Arnone started the Grow Monmouth program to help revitalize the county?s business climate, developed a Façade Improvement program and set-up a Tourism Advisory Group to bring mayors and tourism leaders together. Director Arnone also created the annual Made in Monmouth event to exclusively showcase locally-made consumer products. Prior to his election as a freeholder, Director Arnone served as an elected official in Neptune City. As mayor, from 2004 through 2010, he was instrumental in the acquisition of more than $1.5 million in grants and the successful renovation of underutilized areas in the community. As a council member from 1997 through 2003, Director Arnone held positions as Police Commissioner, Public Works Commissioner and the Finance Committee chairman. Active in statewide organizations, Director Arnone currently represents the County on the North Jersey Transportation Planning Authority. He is a board member of the Salvation Army Asbury Park Corps, serves as vice chairman of the Monmouth Ocean Foundation for Children and organized the inaugural Pound the Pavement for Purple in 2014 to support pancreatic cancer research. 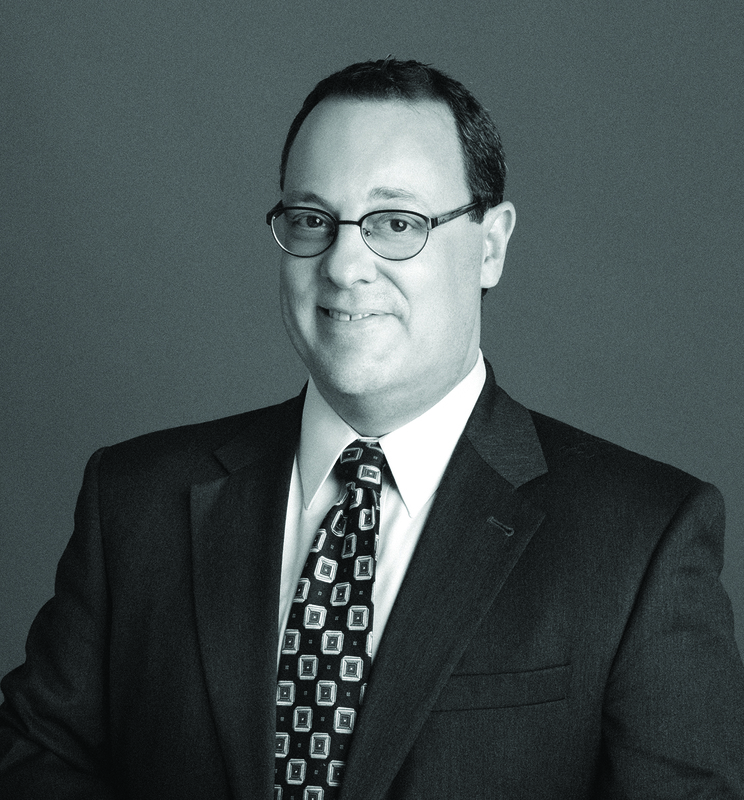 Director Arnone served as the 2010 president of the New Jersey Conference of Mayors and has been an active member of the New Jersey League of Municipalities. Director Arnone and his wife Catherine reside in Neptune City and have a daughter.